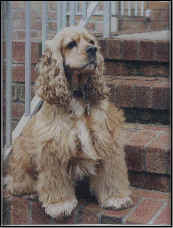 Rusty was my first dog, which I'll never forget. We adopted him at a shelter in Perth Amboy, NJ on August 12, 1995; he was four or five years old at the time. We were all lucky we did, because all the animals were going to be put to sleep the next day. We took him home and did not know what to do with him and he did not know what to do with us. The weeks passed and we got to know each other better. By Christmas he was helping us open our presents (tearing them open without us even knowing). I even taught him to sit, stay, paw, and roll over at age 5, who says you can't teach an old dog new tricks? On February 4, 1999 he ate an acorn without us knowing. A few hours later he started vomiting and was not comfortable lying down. We took him to an emergency hospital and they took x-rays. The next day my dad took him to our local vet who had the x-rays. He had an object stuck in his intestines. We got a referral to go to an animal hospital where he had surgery. They found out that the object was an acorn, and sewed up the intestines, his recovery was optimistic. A few hours later he had a second operation to make sure everything was O.K. but it was not. His intestines were pink, which were not supposed to be. The doctors found out that his liver was damaged (from the Phenobarbital he was taking because he had seizures and that helped control it) and was not helping the recovery. The vet's office called and said he had to be put to sleep or he would suffer and die anyway. He passed away with dignity and honor on February 6, 1999.